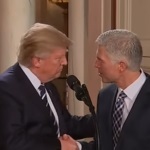 President Donald Trump falsely claimed a Democratic senator “misrepresents” a conversation that the senator had with Trump’s Supreme Court nominee, Judge Neil Gorsuch. In fact, Gorsuch’s spokesman confirmed the senator’s account. Linda McMahon’s U.S. Senate campaign recently used the social networking site Twitter to misrepresent former Rep. Robert Simmons’ position on tax credits for businesses and the dividend tax. McMahon and Simmons are battling in Connecticut to become the GOP nominee for Chris Dodd’s Senate seat. If you live in Connecticut and are a registered Republican, you may have received a mailer or two from former World Wrestling Entertainment CEO Linda McMahon attacking her opponent in the state’s GOP Senate primary, former U.S. Rep. Robert Simmons. But some of the mailers’ claims are false.